I have had that Kiss song stuck in my head since yesterday morning. I had been feeling under the weather last week and took Thursday and Friday off, which found me gravitating toward my books and fabrics. I just lay on the bed and opened up my favorite book (Miss Rosie's Quilt Co - Spice of Life Quilts). I have almost all the patterns in that book and bought the book mostly for the pattern called Elizabeth. 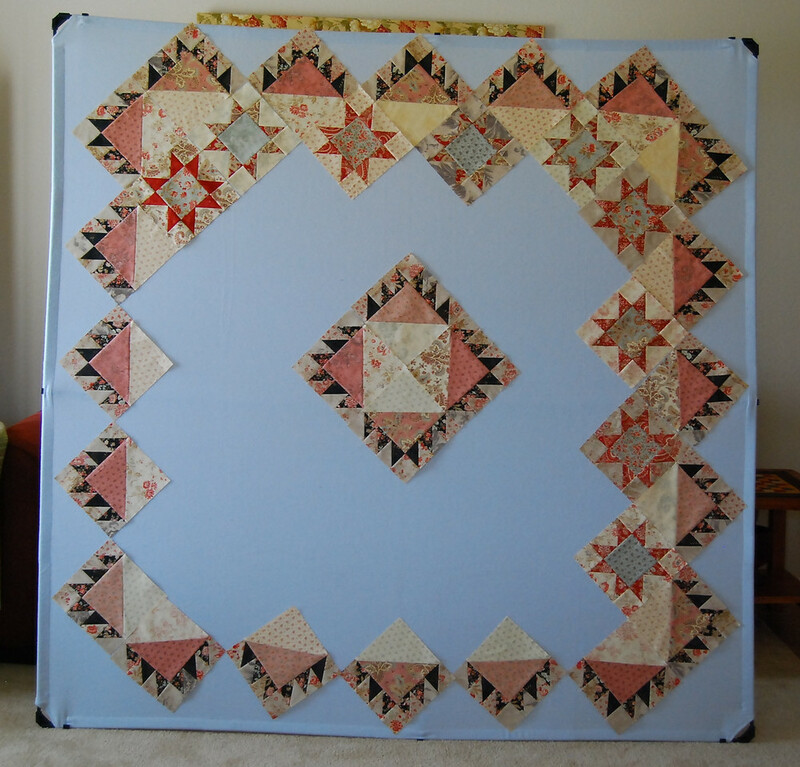 I fell in love with that pattern a while ago but the half square triangles were killing me and so I kept saying to myself that I could only get this one done when I had time to hit my head against the wall with those HST. Well last week while I was in bed staring at the pattern I decided to break it down into pieces. I pulled my post it notes and started breaking the pattern down. I like to do this so I can determine color and to visualize the actual process of making each piece. It's not the same to know there are 24 delectable mountain squares than to know that each square will have 6 small half square triangles and a large half square triangle with a single 2.5" square. So the delectable mountain breaks down into 8 units. 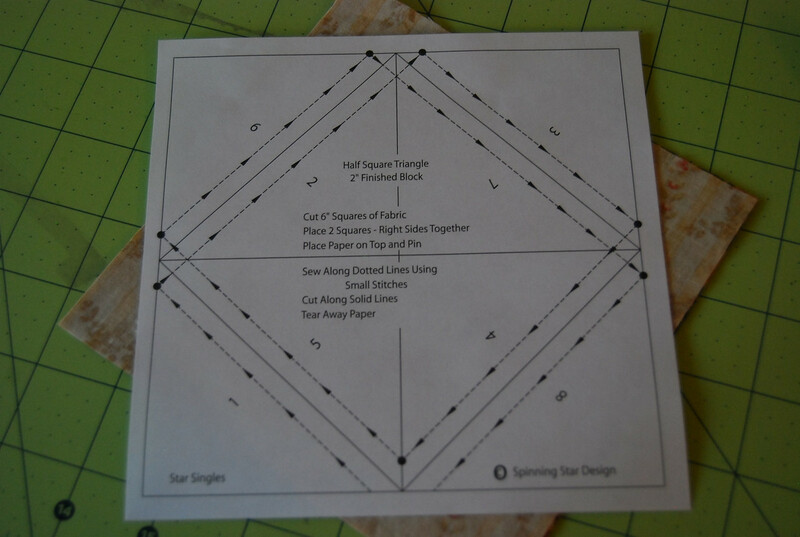 As I was breaking down the quilt I chanced to remember that last week at the quilt show I dropped by the Bonnie Blue Quilt booth and picked up some Spinning Star triangle paper, Nicole blogged about a couple of months ago. I wanted to give it a try since I'm not having much luck loving any method of making HST. This had me out of bed scrambling for my Luna Notte FQ bundle (I chose my fabrics a LOONNNGGG time ago). One thing I needed to figure out was how to keep the paper stable without the pins. I find that the pins distort the paper a bit and I have a problem with that. 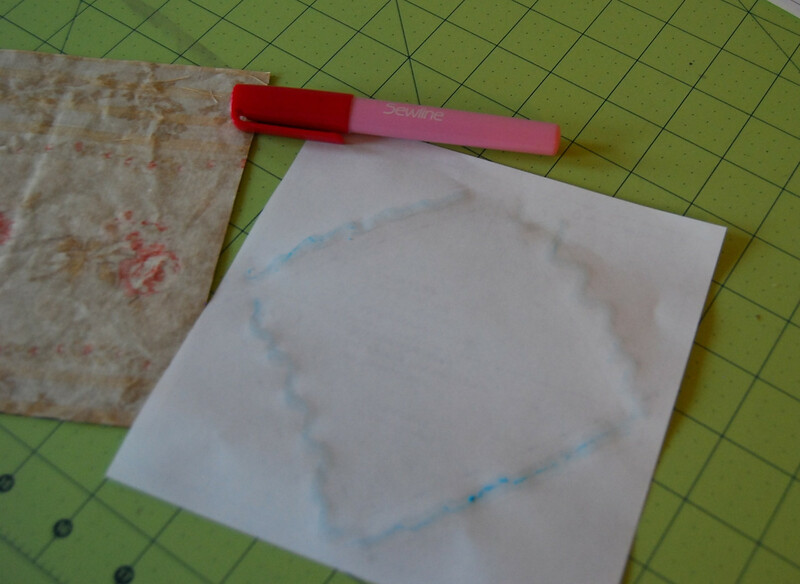 It occurred to me that if I can stabilize my Bali Wedding Star pieces with this Sewline glue stick and have minimal, to no residual glue, I can use it on these HST papers. Worked like a charm. All I had to do was follow the lines and these puppies were getting completed in no time at all!! I was done with the HST in blink of an eye. 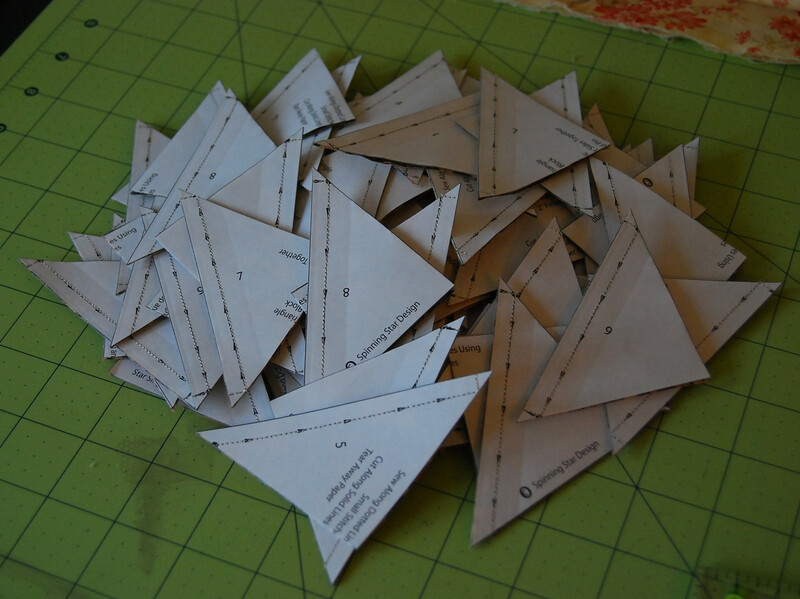 I then sat down and trimmed the papers (much easier than trimming each individual triangle since it's just follow the line - no measuring). I pulled the paper off the little buggers while I was in bed watching Fringe. At that point I realized... I was done with the most intimidating part of this quilt. Beth started to take form as the weekend progressed. Even though I was feeling crappy the progress on this one was amazing. Yesterday I went back to work and that Kiss song kept playing over and over in my head. It seemed like this quilt kept calling me. I could not wait to get back to the project. 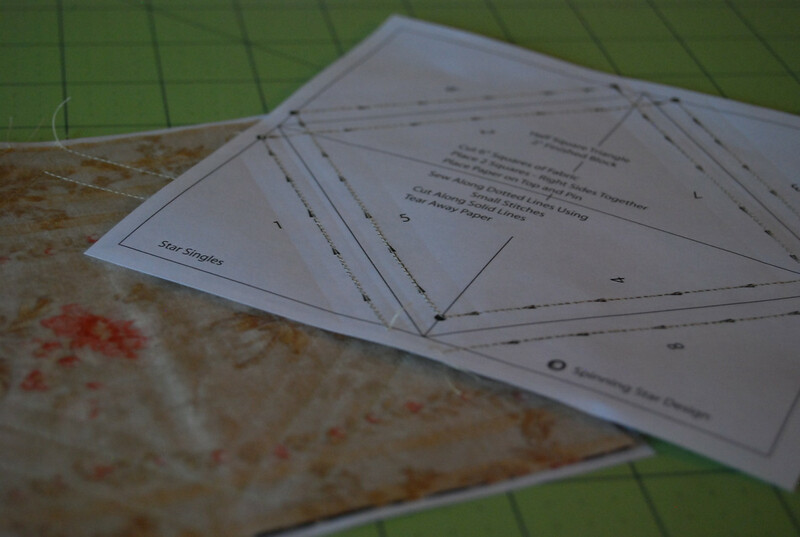 I'm wrapping up the stars but I ran out of the light cream fabric (marble tones). I am a bit upset over it since it was due to a mistake in cutting - cut more than I needed, but I'm hoping to find more online, someplace! ARG! 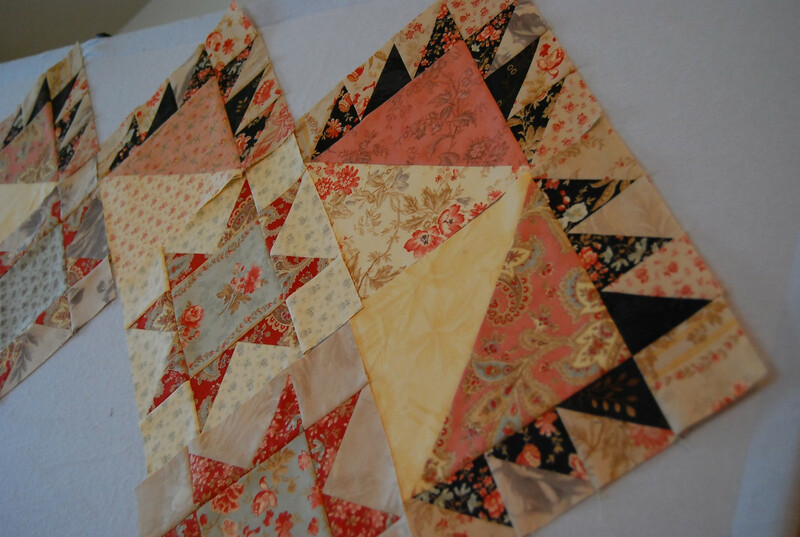 In the meantime, I have some four squares to make. Lesson on this one, don't let the pattern intimidate you. Just break it down to the elemental pieces and take it one block at a time. Oh... and make sure you don't cut more pieces than you need when you have a limited amount of fabric. 6 comments on "Beth, I hear you calling...."
Lookin' good! I can't wait to see it when it's done. omg, that is gorgeous! Now I want to make Elizabeth again! Beth is off to a great start! My brain works better if I break it down also. Thanks for the peak into the process! Sandy, I love this pattern, it's been on my To Do List ever since Nicole made hers, out of French General I think. Your "Beth" looks wonderful in Luna Notte! Good luck finding that last bit of fabric you need! I've never heard of a sewing glue stick, I need to check that out, very clever of you!